These are my favorite cookies. 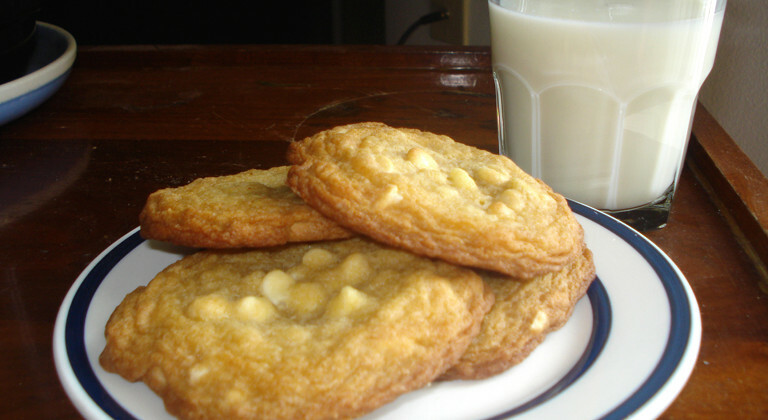 If I had a giant plate of various cookies in front of me, I would grab the white chocolate macadamia nut cookie first, no questions asked. I used to think of these cookies as a gourmet treat, and thought they would be difficult to prepare. How wrong I was! These cookies are simple to make, with a gourmet taste. I remember the first time I tried a macadamia nut. I was a young girl, and family friends had returned from a vacation to Hawaii. With them they brought back Mauna Loa Macadamia Nuts. Yum! I was hooked on the soft buttery flavor. When I found out people mixed the nuts with white chocolate in cookies I was in heaven. WARNING! Macadamia nuts are toxic to dogs, so keep your dog away from these cookies. I used white chocolate chips in this recipe. They worked well, and satisfied my craving, however, I would recommend using white chocolate chunks. Store in airtight container. Store 3 to 4 days at room temperature or freeze up to 3 weeks. Preheat oven to 375 degrees F. Lightly grease 2 cookie sheets. Blend butter, sugars, egg and vanilla extract in process until creamed, about 1 minute. Scrape down sides of work bowl as you mix. Add flour, baking soda and salt, and mix until just combined. Do not over-process. Stir in chocolate and nuts by hand. Mound dough by 1/4 c onto prepared cookie sheets, spacing 2 inches apart. You should have 8-10 large cookies. Bake until light brown around edges, about 14-16 minutes.